It’s been one of the more unusual Mondays I’ve had recently. I think most associate the day with dread and disdain and sadly wish for the return of the weekend. I feel no different yet I’m unsure as to why, but nevertheless, I was feeling a bit more apathetic than usual this Monday morning sometime after receiving a phone call that forced me into being more awake and alert than I intended. I’ll apologize to him later if I seemed uncaring about his recent business ventures. I eventually dragged myself out of bed and down to the kitchen for what I purposely prepared the night before: a of cup iced coffee, sans ice, made with French vanilla flavored coffee grinds and ice cream flavored cream. It’s the perfect drink to put you in a happier mood that hopefully will chemically perk you up in the process. An odd thing happens during springtime. While it’s pleasantly warm, naturally heated by the sun and whatever breezes brought on by southern jet streams and the planet tilted in such a way that make up outside weather, in my house it feels 15 degrees colder thus making me search high and low for my beloved sweatshirt to find warmth and comfort. Instead, I decided to take my chilled wake up beverage outdoors. In my backyard rests a tattered and weathered but still very much used wooden picnic table, frequented often by squirrels that I have a fascination with. I would have chosen this spot to sip my coffee and admire nature, but considering I lacked the energy and will power to look for my sweatshirt, I felt even less compelled to trek back to my room to retrieve my shoes and I don’t like being barefoot in my yard. I had left a number of items up there, actually, including my laptop and my phone. Most times I’m never found with out either or both. But at that moment, if I get a phone call, text, or email, it can wait until I return. There’s no need to tell the social networks I plan on being anti-social for a while. 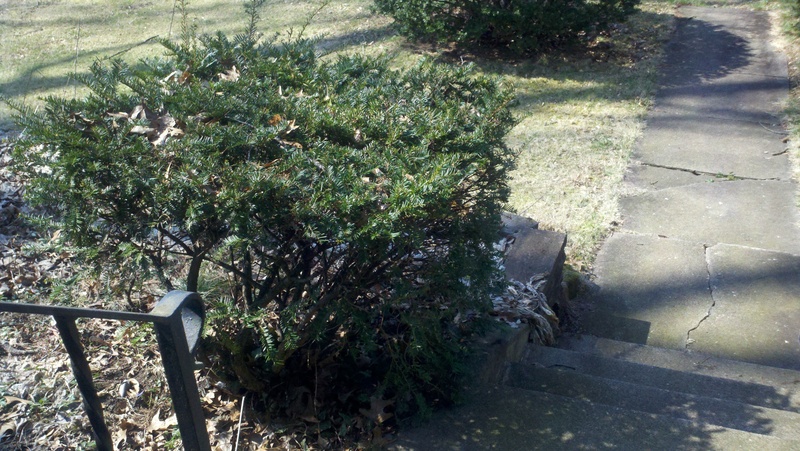 So I retreated to the front porch steps as I still steadily shook off the feeling of sleep. Immediately, I took in the blue sky, which was 99% cloudless. There were a few wisps here and there, but nothing that would constitute a legit cloud or produce shade. However, the sky did seem to have a haze, but nothing to depreciate the value of beauty God’s nature was giving me. There was a breeze ever so gentle. Enough to make the pine needles and very small naked branches move, but not enough to move a dislocated leaf left over from last autumn from one spot, to another. At least not very far. 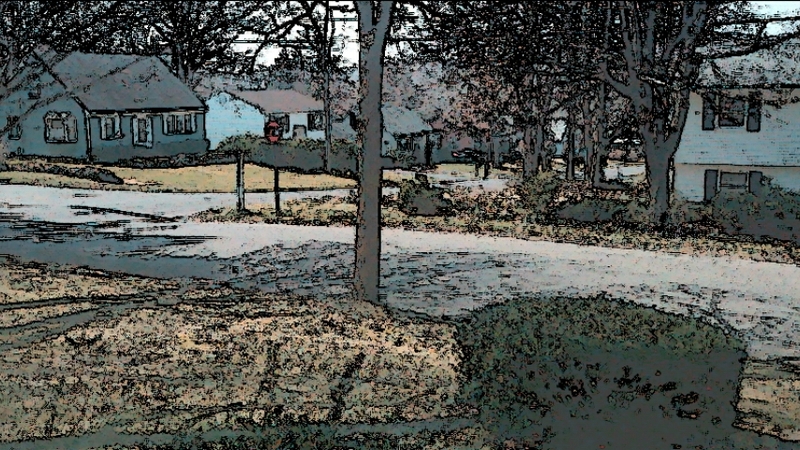 I listened to the sounds that I feel I may have taken for granted all these years as a product of suburbia. Or perhaps it’s just a sound I never noticed consciously. While city folk may proclaim the majority of the ambiance to be silence, giving an effort to listen I heard so much more. Some of which could become a nuisance if complete and utter silence is what you desire. 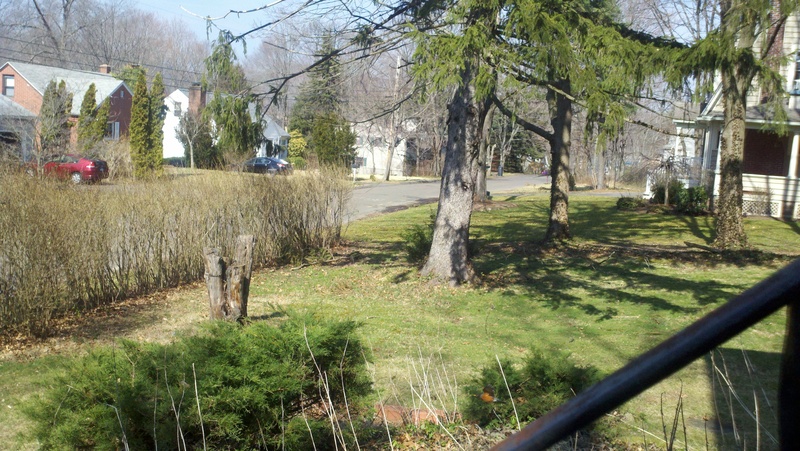 Half the sounds aren’t natural, but are normal to the suburbs such as the occasional car or more obtrusive motorcycle. And if you live within a mile of a small private airport, you’ll altogether tune out the occasional low flying planes. But normally, at any given time, you’ll hear the hum of human activity either getting louder or quieter. If you’re lucky, you’ll be awakened by constructive neighbors incessantly hammering a roof or some other outdoor home improvement project you wish they saved for a rainy day. 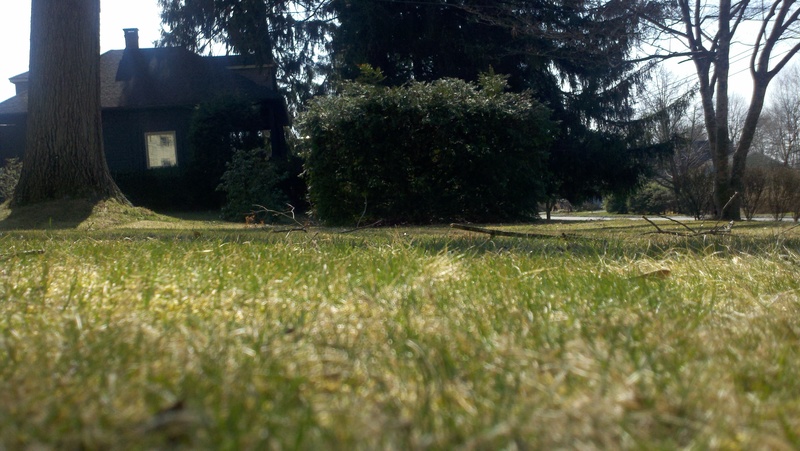 And as it gets warmer, especially later in the day, the lawnmowers will be added to the subtle hum. But before lunchtime, bird chirping is a constant, ongoing song. The original twitter. I know very little about birds, so I couldn’t tell you what is responsible for what squawk. I’d assume robins, crows, blue jays and sparrows, but again, I’m not a bird watcher. Yet, I was watching the birds among many other things. Interesting note: I saw more birds hopping and walking than I saw flying. Mostly the squirrels, which I interrupted my extended morning coffee break to retrieve a few walnuts for what I’d hope to be a squirrel feeding. For reasons that would probably make for a separate essay, I’d just like to make know my fascination with squirrels. I also have a strange fascination with cell phone towers, watching slugs eat mushrooms, and people watching. Observation is a craft. Anyway, my focus was on the squirrels at this point as they scurried all over my yard, digging randomly and finding what appear to be nuts and acorns or something delicious according to them and their furious nibbling. One squirrel I’m especially curious about I’m wondering had an accident or is just very young or deformed: it appears to be missing half it’s tail. 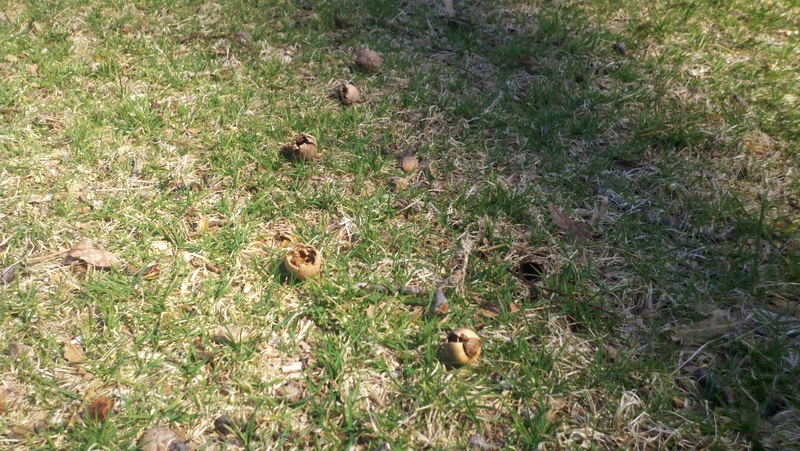 Considering spring is still springing to life, I felt I’d help out my neighborly critters and toss a few walnuts. I did this a few days ago on the opposite side of the yard but have yet to investigate if my gifts were received. I also wonder if there would be adverse actions to my kindheartedness other than finding walnut shells left on the picnic table. I’m amused they use it as a setting to eat food, too. Perhaps I’m not seeing what their seeing due to our height difference. Not wearing any shoes prevented me from going out to the yard to get a squirrel POV. Plus, due to my stillness, a lot of the neighborhood animals were closer to me which made my observing experience more rewarding. Moving the slightest bit would frighten them off… as does walnuts bouncing and rolling within inches of them. My mind drifted into thinking what daily life would consist of being a squirrel. I realize, or maybe it’s more of an assumption, that squirrels aren’t really self aware, so it’s possibly they probably aren’t really thinking at all, let alone caring that they are a squirrel. I know there are scientific and philosophical studies going on about the very nature of nature, but it’s more wonderment than analysis for me. To be a squirrel, or even a bird… not bound by the stressors of deadlines, debts, taxes, technology or anything of human life. Instead, I guess you’d just be tormented by larger creatures (cats, dogs, people) and machines (cars, lawnmowers, chainsaws). My thoughts took a weird turn, thinking about these thoughts, wondering if people would think I was weird for thinking it. But then, almost immediately, I stopped caring about that. For all I know, people could be thinking the same thing given the same opportune chance and setting. For a solid hour, I stopped caring about what I needed to get done or what I should be doing. I had no idea what time it was, nor did I care. I guessed what time it was based on the shadows from a bush next to the porch, which then led me to wonder where the best spot in my yard would be ideal for a sun dial. I left that thought alone and returned to thinking about near-nothing, and watching the squirrels and birds seemingly ignoring each other. The other sounds heard at this time in the suburbs are the occasional dogs barking, either some houses down, or maybe a block away. Similar to all the birds chirping, I’m wondering if these dogs are communicating to each other, or maybe barking at someone or something because they just like to do it. More musings I’m not looking for an explanation for. The other thoughts I have, as I remember I left all my communication devices inside, which of my friends would be interested doing exactly what I’m doing with me, or at the very least, not mind my comfortable silence. The list of people is short, because the friends that come to mind are readers who enjoy being outside. It’s my personal opinion that some people feel compelled to speak to break up the silence, thinking it might be an awkward silence, when in actuality, there are some settings when speech isn’t required. Before long, the sun could clearly see the shrub that was acting as my clock. The shadow from my house that hid the bush had shifted, and I noticed more insects crawling and flying than when I first emerged. I knew within time, their annoyance would bring me back to reality and I chose to return indoors on my own terms. My experience inspired me to write, even if many of my readers would find this particular event boring, since nothing really happened. But overall, it helped clear my mind of trouble and stress that started to creep, if not already present in my life. The things I planned to do and still need to do will get done eventually, but being unplugged for a while was definitely a necessity for me. Too often I get bogged down with so much stuff that I can forget how to appreciate the simple things in life. I immensely enjoy a lot of the stuff I occupy my time with, but I know if I’m not careful I could easily burn out and become less of a husk of a soul. Letting go of my thoughts and cares outside has since rejuvenated me and enabled me to jump into whatever challenges or tasks that await me today and the rest of this week. In short, it’s good to get out and enjoy nature once in a while. And wouldn’t you know it, my shoes were never in my room! Guess who’s going back outside?